Over the age of 50 and considering selling the family home? If you are, consider a REALTOR® with senior experience, knowledge and marketing savvy. 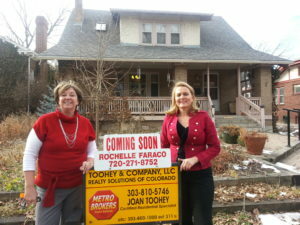 Joan Toohey and Rochelle Faraco are certified senior specialists and astute to the financial and emotional challenges senior clients face when they sell a long-held family home. They can create a customized approach to marketing and selling your property. They’ll also work with you to explore your housing options to ensure that your next home best serves your current and future needs. Joan and Rochelle have special knowledge about everything from reverse mortgages and the importance of universal design to the uses of pensions, 401k accounts, and IRAs in real estate transactions. And when you need help from other professionals, they can tap their network and put you in touch with qualified home inspectors, movers, attorneys, CPAs and other experts. So if you’re thinking of buying, selling, renting or relocating, call Joan and Rochelle for specialized help with your real estate transaction.